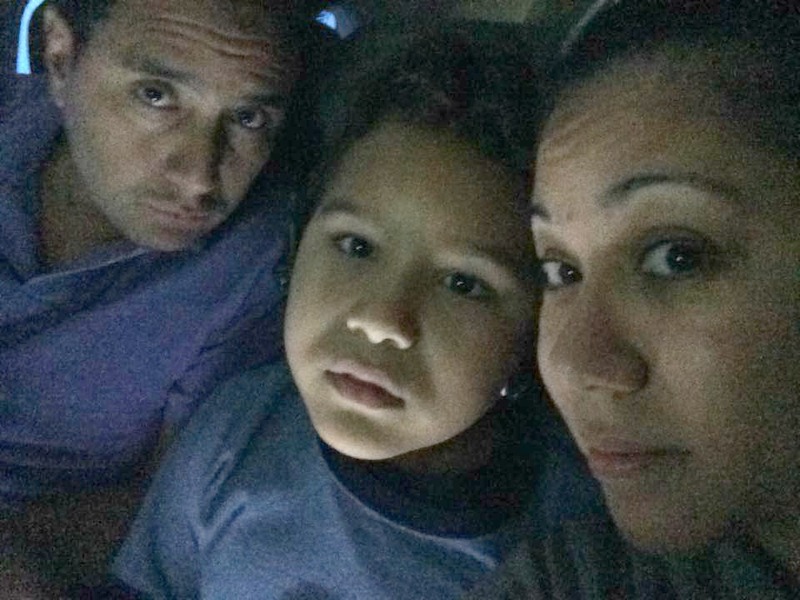 Or that one time when my kid had an EPIC meltdown on JetBlue. Last week we traveled to Walt Disney World with my parents and younger sister. It was their first Disney vacation and our first family vacation in years. I have so much to share about our week, but first I need to get this out of the way. If you follow my Instagram, we all look like we’re having a grand time. And we did. But the truth is, our magical vacation didn’t start off so magical. Selfie taken after Norrin’s meltdown. Norrin is a pretty easy kid to handle. Oh sure, we have our moments but, for the most part, I rarely feel like I can’t control him. He doesn’t get angry or have meltdowns often. And when he does, it’s usually over within a few minutes. I was reminded of autism last Saturday when we experienced the WORST MELTDOWN EVER – an autism awareness moment to the umpteenth degree. It happened shortly after boarding our flight to Orlando. Before we left our apartment, I began to sense Norrin’s anxiety. We’ve been talking about feelings a lot lately. And I’ve been using Disney’s Inside Out characters to talk Norrin through his emotions. A while back he found these cool Funko Pop figures and I ordered them as Christmas gifts. Then I thought I could use them as incentives for our trip. I gave him Fear because I knew he was feeling a little nervous. I wanted him to know it’s okay to be fearful, but we still need to follow the rules, listen and move past our fear. When we arrived at the gate, I informed the attendant I was traveling with a special needs child and requested to preboard. While she couldn’t accommodate our family of 6, she allowed me to board the plane with Norrin and my 70-year-old dad (the man hasn’t been on a plane in 60+ years). Just as we were about to sit Norrin requested to use the bathroom. It wasn’t so much of a request as it was a panicked plea. That should have been the red flag. Norrin is pretty resourceful and when he doesn’t want to do something, he looks for a way out – usually the bathroom. Walking up the narrow aisle I hear, “I think we may have gone to high school together.” Immediately I recognized the voice. It belonged to a dear high school friend I haven’t seen in nearly two decades. And he happened to be one of the flight attendants. Thank goodness for chance meetings. We hugged hello, but Norrin started to run off and I ran after him. When we returned to our seats, my husband, Joseph, mother and sister boarded. Norrin refused to sit down. And when he did sit down, he refused to buckle his seat belt. He began screaming, “Stop!” “Let me go!” and “I’m afraid!” Tears were streaming down his cheeks, his face was red and he was breathing hard. He was clutching at the seat in front of him. I could see the fear in his eyes. Joseph and I struggled to restrain him, to calm him, and buckle his seatbelt. But we had reached the point beyond reason. “What should we do?” I whispered to Joseph. For the next few minutes, Norrin continued to kick, scream and cry. We felt helpless and completely exposed. Joseph was frustrated, I was on the verge of tears. It was one of those rare moments when we just didn’t know what to do. It wasn’t our first time on a plane. It’s Norrin’s fourth trip to Florida. He loves planes. We had talked about the trip and taking the plane all week. Where this fear came from – I still have no clue. Finally, Norrin calmed down. He buckled his seat belt. And the plane took off. No less than ten minutes in the air, Norrin asked to sit by the window. 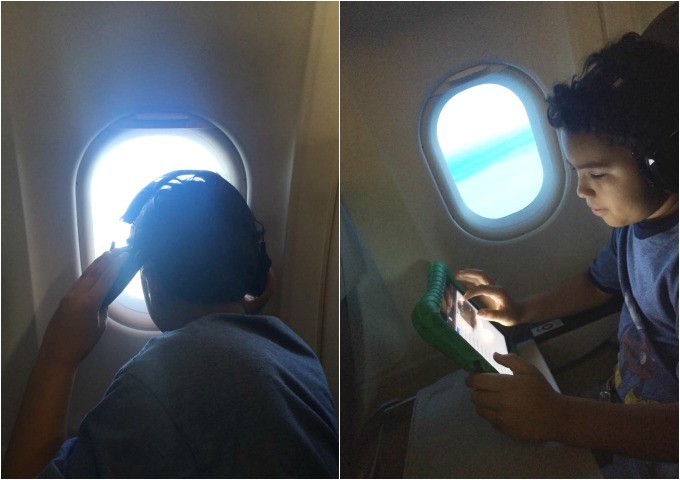 He looked out the window, ate his snacks, drank his juice and played on his iPad for the remainder of the trip. I don’t know if we would have been kicked off the flight. Joseph believes that it’s because of my friend, we were able to stay on. Maybe. Or maybe it’s because JetBlue supports the autism community and strives to make flying easier for special needs families. JetBlue makes an effort to be aware and to accept. Everyone on the flight was patient and understanding – including the couple who sat in front of us. With every apology I offered, I was given a smile and “don’t worry about it.” It was comforting to know that even though my kid had this major meltdown – I didn’t feel judged. While our flight back was easier, we’re not making plans to fly anytime soon. But when we’re ready, we’ll fly JetBlue again. They made us feel welcome. I feel like they just get it. Oh Lisa, I’m so sorry that happened. You did everything right, but with special needs kids sometimes it doesn’t matter, they will have reactions. While my youngest son does not have Autism, he has behavioral issues and a speech delay. Most likely he has ADHD like his big brother – nothing is being confirmed yet. 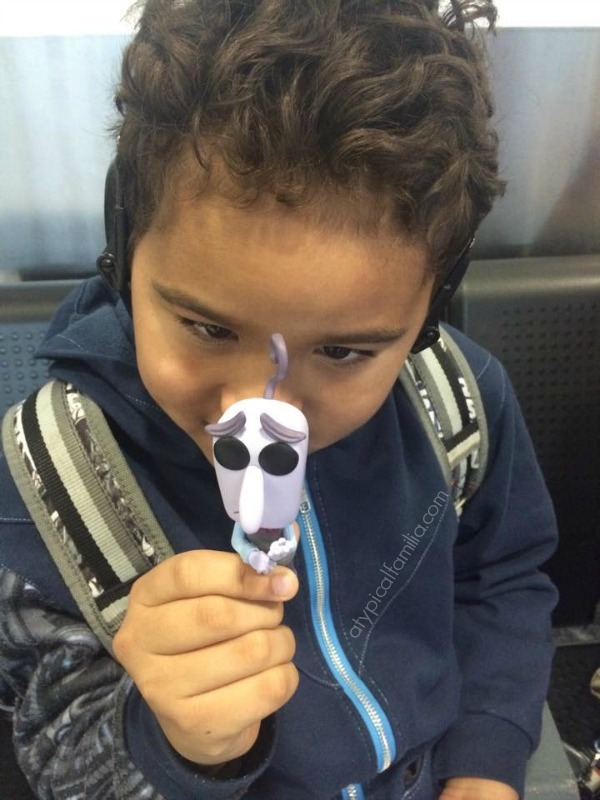 My little guy surprisingly was fine on our flight down and back to Florida in February, but melted down everywhere and every way he could on the trip. I don’t think I can take him for a long time. I had retweeted your commendation to JetBlue on twitter when I saw it. I do believe that they are one of the best airlines and I try to fly them whenever possible.